Soon you'll be able to listen with your skin. Neuroplasticity is the idea that the brain constantly changes throughout an individual’s whole lifespan. This means that a brain can connect and re-connect its neurons to other different neurons. 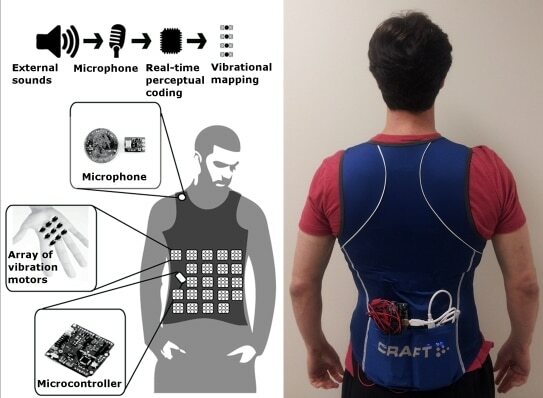 Such an idea is at the heart of neuroscientist Dr. David Eagleman’s development, a vest that uses the sense of touch to help the deaf ‘hear’ again. Eagleman, together with Scott Novich and his team from Rice University developed this technology using the Sensory Substitution technique. It is the technique that takes over the functions of a damaged sensory organ by feeding information to another channel, usually another sensory organ. This is why some blind people are able to use echolocation to ‘see’ their surroundings. The Versatile Extra-Sensory Transducer (VEST) is outfitted with an array of motors that vibrate when a microphone picks up sound from its surroundings. The sound picked up by the microphone is processed by a micro controller which then translates the data into intricate vibrations that a person could feel. With a bit of getting used to, a person can finally perceive sound through tactile means. The VEST joins a growing list of devices that allow people to sense their surroundings in different ways and even help some of them regain their senses. Technologies like a bionic fingertip allow amputees to regain their sense of touch. Other technologies, like a shirt that senses air pollution allow people to perceive whole new aspect of the world. Eagleman shares the same vision saying that the VEST could be used to stream stock market prices allowing people to perceive the world’s economy. Pilots could sense the orientation of their plane intuitively allowing for a much more stable flight, and astronauts can ‘feel’ the status of the International Space Station using this technology. All of this could completely transform the ways humans can perceive reality.